WooCommerce is a free WordPress plugin that is really useful for ecommerce businesses. This plugin was created in 2011 and is now used by thousands of ecommerce websites worldwide. It is an easy toolkit that lets you sell anything you want online. More than 50% content websites on the internet are powered by WordPress! Recently, the team behind Woocommerce was acquired by Automattic (the company that makes WordPress). This means Woocommerce gets the direct attention from the WordPress team itself thereby making sure you get the best e-commerce platform to run your store. If you are thinking about creating your own online store, you definitely should give WooCommerce a chance. It does not take very long to install and works great. Before we start talking of the various benefits that woocommerce offers, it is worth knowing that Woocommerce currently powers 29% of the e-commerce websites all across the world. In the US alone, WooCommerce accounts for 29% of the e-commerce sites. In Canada, WooCommerce's market share goes up to 37%. And in India - 41% of the e-commerce websites are powered by WooCommerce! One of the greatest benefits of WooCommerce is that it is free. This toolkit will make selling products online very easy, and it will not cost you a thing. All you have to do is download this plugin, and you will have it in just a few minutes. This is really good news for people who are starting online stores with very little capital. Operating a business can get expensive, so it is always nice when something is free of charge. You just have to pay for web hosting. If you are starting up, you can go for e-commerce shared hosting plans from trusted companies like InMotion, Hostgator or Servint with prices starting at as low as $5 per month. WordPress supports millions of websites today, and you have probably had experience with it before. Since WooCommerce is a WordPress plugin, past users of the platform will easily be able to figure out how to use it. If you have used WordPress before, you likely will have no issues navigating through WooCommerce. The settings page has the regular WordPress layout and uses tabs across the very top. This kind of familiarity means that you will save a lot of time and confusion when creating your online store. If you used a more complicated system, you are more likely to get frustrated and give up sooner. WooCommerce might be free to install, but that does not mean it does not look professional. The platform includes detailed order tracking and customer engagement tools, which allow your customers to look at their past orders and get updates of their delivery statuses. It also comes with different shipping options and tax settings. When customers see how organized your online store is and how easy it is to pay for the products, they will be very impressed. The great thing about WooCommerce and its POS is that it is regularly updated, so you do not have to worry about any security issues. Since it is updated on a regular basis, it will always be compatible with newer versions of WordPress and will not experience a lot of bugs. Automattic (makers of WooCommerce) works with leading experts in the web security industry to constantly monitor the codebase for vulnerabilities and pushes updates and bug fixes faster than ever. With a superb one click update system, getting bug fixes and security updates on WooCommerce is super fast and very easy. Also, being open-source, WooCommerce benefits from the worldwide developer community in terms of new features, faster improvements and a great community. If you want to keep track of your ecommerce website, it is essential to have an analytics tool. However, analytics can sometimes be pretty complicated for people just starting out in the ecommerce business. Many of them are not aware of the technique behind analytics. The great thing about WooCommerce is that it makes analytics super simple; its inbuilt analytics does everything on its own. Things like sales by date, individual customer statistics and total sales and average order totals are presented in neat little pie graphs. You will be able to see how your ecommerce site is doing every day without putting any extra effort into it. Apart from these you can easily integrate modern analytics solutions like Google Analytics, Kissmetrics Heatmaps, Sumome Content Analytics pretty easily with WooCommerce. Another great thing about WooCommerce is that it offers a lot of flexibility. For instance, products can be categorized and given sale prices at any time of the day. WooCommerce stores are able to sell virtual, physical and even downloadable products. Additionally, WooCommerce POS solutions offer the ability to accept many kinds of payments, which makes purchasing items more flexible for your customers. You can move different elements across the page whenever you feel like unlike hosted store options like Shopify or Squarespace. Not only this, you can use custom templates and designs for particular product pages and different categories using WooCommerce. One of the best aspects of WooCommerce is all the customizations options. This means that your online store does not have to look like everyone else’s. Right now, WooCommerce has 39 themes to choose from, so you can definitely find one that you like. Once you have picked the theme you want, you can start experimenting with the colors and styles. If you get tired of a certain WooCommerce theme, you can always change it. It is the buzz word of online marketing right now. With better content you can target low hanging long tail keywords, thereby making your website rank higher on Google Search engine results pages. You can also educate your target customers about your niche and help solve their various problems using compelling content. When it comes to serving content to your prospective customers, WordPress is the undoubted leader. An integration of WordPress and WooCommerce gives you the best of both worlds. 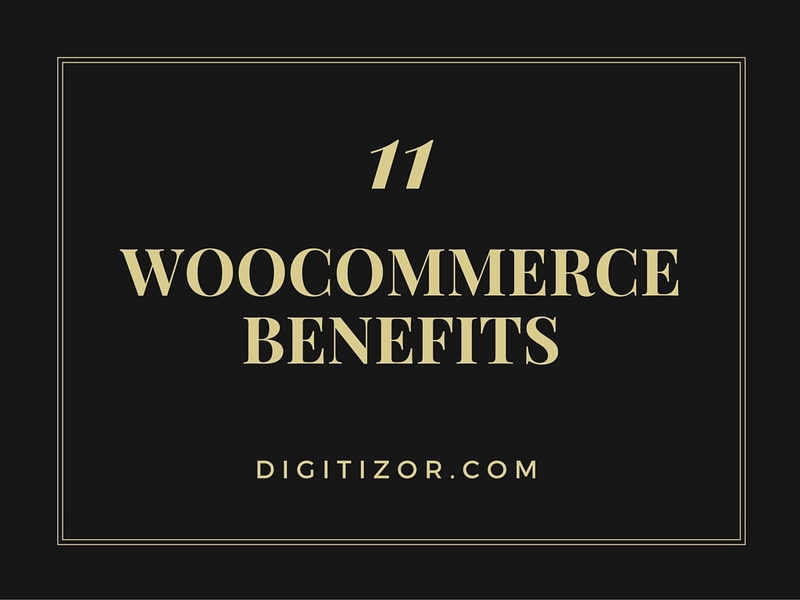 As you can see, there are plenty of benefits of using WooCommerce. It is not only free and easy to figure out, but it also looks professional and offers a lot of flexibility. If you are starting your own online store soon, you definitely should think about using WooCommerce. You can get it installed in just minutes and you will be on your way to a more professional looking online store. Your customers will be able to buy your products with ease and will be impressed with how you have things set up.